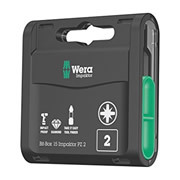 WERA 057763 Bit-Box 15 Impaktor PZ2 - High quality bits for PZ screws in a practical Bit-Box. Impaktor technology ensures above-average service life even under very demanding circumstances. The enhanced friction resistance from the rough diamond-particle coating on the tip of the bit prevents any slipping out of the screw head. Torsion zone specially designed to absorb such forces and thereby protect the bit tip. The combination of the double torsion zones in the Impaktor holder and the torsion zone in the Impaktor bit result in the so-called TriTorsion system. Specially developed to withstand high power too lforces, particularly suitable for use with customary impact drivers; 1/4" hex, appropriate for holders as per DIN ISO 1173-D 6.3. 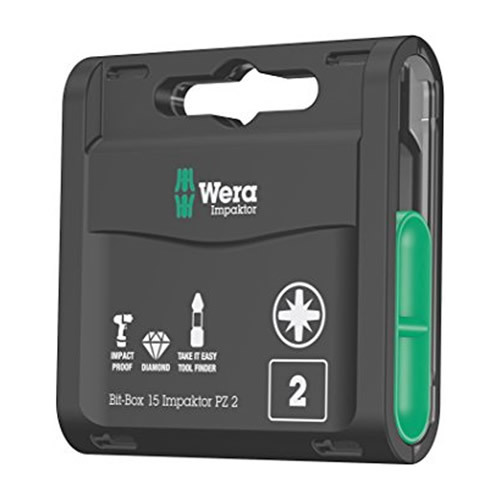 Comes with "Take it easy" Toolfinder, colour coding according to profile and size stamp.